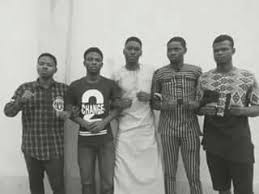 UNIBEN GIST: PRESS CONFERENCE: COALITION TO REINSTATE UNIBEN 5. PRESS CONFERENCE: COALITION TO REINSTATE UNIBEN 5.
of this great Nation States are specially invited to a Press Conference to inform Mr. President of the Federal Republic of Nigeria, Edo State Governor, well meaning Nigerians and the World at large on how the Management of University of Benin victimized some Students Union Leaders for peacefully protesting against School Fees and Hostel Fees Hike among others. Date: Friday 9th February, 2018. Venue: Nigeria Union of Journalists (NUJ) Press Centre, G.R.A., Benin City. A threat to justice any where is a threat to justice every where! !